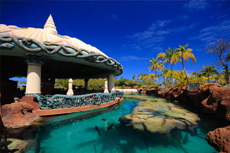 Enjoy the luxury of the Atlantis resort on Paradise Island. One of the most expensive hotels in the world, Atlantis is home to a variety of attractions available to day visitors, ranging from an impressive assortment of massive water parks to the world's largest open air marine habitat. The boys did the Dip and Dive at Atlantis, and we spent the rest of the day at the resort. The boys did the Dip and Dive at Atlantis, and we spent the rest of the day at the resort. I was good, except the walk back. It was WAY too far. They should have golf carts to get you back to catch the buses..
We loved Atlantis and enjoyed our day at the waterpark! We loved Atlantis and enjoyed our day at the waterpark! Would recommend booking the excursion through Norwegian even though it is more expensive because they include a shuttle to and from the port. It would have been perfect for adults or older children. It would have been perfect for adults or older children. It was too expensive for 2 adults with 2 little children. The water park is amazing and the kids had a ball. The water park is amazing and the kids had a ball. Big lines but they move quickly. Our day in the water park came with lunch a real value. Our day in the water park came with lunch a real value. We also made our own way over to the water park so we got there early and were some of the first guests to ride the slides. Which we could have stayed longer. The port at Nassau was busy and fun. LOVE going to Atlantis Aquaventure! This was a good excursion- wish we had little more time to enjoy the beach it was perfect weather! This was a good excursion- wish we had little more time to enjoy the beach it was perfect weather! The aquarium was nice. We enjoyed the aquarium. We especially loved seeing all the stray cats and kittens at the resort as we missed our own cats from home! This is the only negative I have about the trip. Large Aquarium with many different fish. Large Aquarium with many different fish. It would be nice if some written explanations were given. Decent aquarium. Not too crowded. Well maintained. Good use a little more signage. It was a little difficult to navigate the aquarium and also the Atlantis grounds. Clean, pleasant staff, good food, nice beach, and decent aquariums. Walked around Nassau on our own and then took a cab ride to Atlantis to check it out. Not worth the very high cost. Had to go to the Atlantis Aquaventure while stopping in Nassau! Our adult children liked the slides and had no crowds. Our adult children liked the slides and had no crowds. Absolutely not worth the price of admission though. Even at half the price this would be expensive, but would then be a very good or excellent rating. Atlantis was a fun stop.